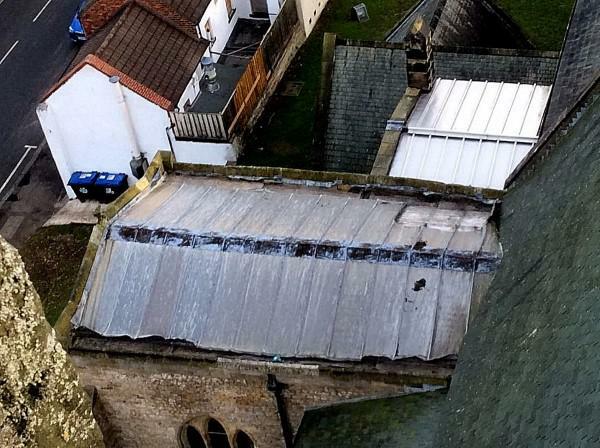 Repairs to the roof of the North Transept at Sedgefield’s centuries old church – which was twice attacked by ‘avaricious lead thieves’ in 2017 – will begin in the Spring, it was announced this week. Reader Michael King confirmed that sufficient funds were now available to cover the estimated £30,000 cost of repairing the roof at St Edmund’s and safeguarding its valuable 13th century timbers. “The roof has been made watertight and will withstand the winter weather”, said Mr King. Donations by well-wishers of £10,067, an insurance payout of £10,000 and a single grant of £10,000 have made it possible to start work on replacing the lead with a stainless steel lookalike which is not as attractive to thieves. Any surplus or further donations will be used to help redecorate the walls of the church which were badly stained by rainwater seeping through the timbered roof before the theft was discovered. Church officials say they are extremely grateful to the many people who have answered the appeal for donations to carry out the repair and “who have clearly demonstrated how much they value St Edmund’s”.